This year, as we celebrate the 50th anniversary of the US Open, we’re counting down the 50 most memorable moments in the history of America’s Grand Slam. Today, we take a look back at No. 37. When the United States Open shifted surfaces from grass to clay courts in 1975 at Forest Hills, the prohibitive favorite was a Floridian named Christine Marie Evert. She had not lost a match on clay since the summer of 1973. Her immaculate groundstrokes and signature two-handed backhand were made for the Har-Tru courts. After falling in the semifinals four years in a row on the grass at the Open, the world No. 1 was entirely at home in the slower conditions and was determined to win her country’s Grand Slam tournament. Perhaps overwrought by the weight of expectations—both internally and out in the court of public opinion—the 20-year-old found herself in a tense skirmish, as Goolagong glided around the court, sprinkling winners instinctively. The Australian took the opening set, and the second set was locked at 4-4, before Evert’s backcourt superiority surfaced. She swept eight of the last 10 games to come through, 5-7, 6-4, 6-2. Down the stretch, Evert elevated her game decidedly. She was impenetrable. Rhythmically, stylishly and comprehensively, she picked Goolagong apart from the back of the court. She would capture the Open five more times and is tied with Serena Williams for the women’s record with six singles championships. 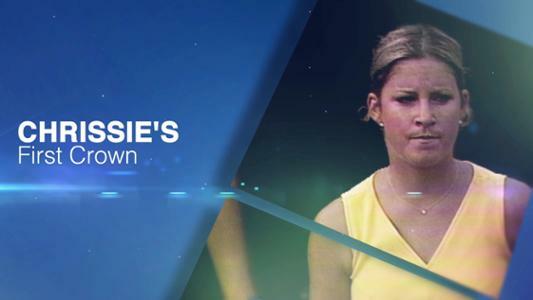 But frozen forever in Chris Evert’s mind is the image of her mother just after she had defeated Goolagong in 1975.